Reading is one of the best and most productive habits we can cultivate. Not only does it add to our knowledge, but also stimulates the creativity of the mind, helping us think better. And thanks to free eBooks, getting into reading has never been easier. Now, there are millions of great totally free eBooks available online, on just about every topic imaginable. But the question is, where does one find this treasure of books that doesn’t cost anything? Fret not, as that’s exactly what this article is intended to help you with. 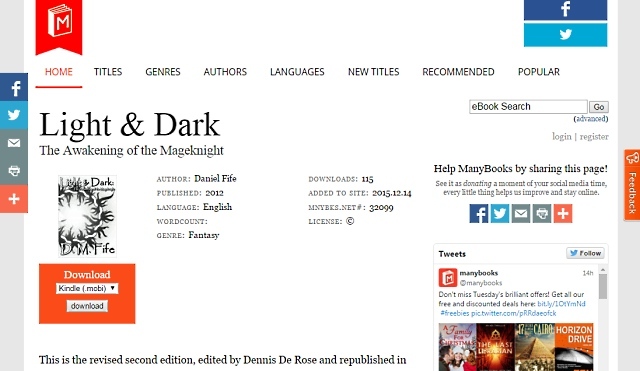 Keep reading, as we take a look at the 16 best websites to download free eBooks, legally. 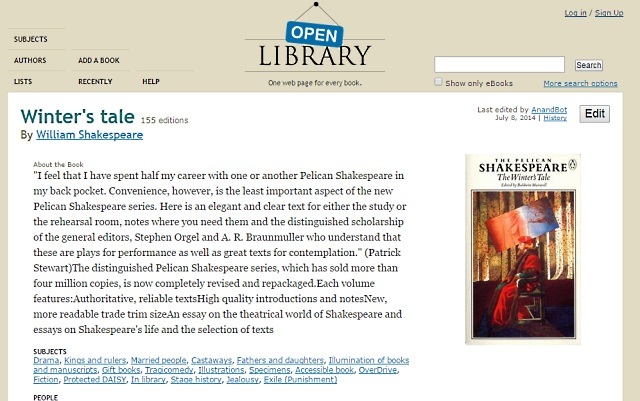 With an aim of creating “one webpage for every book ever published,” Open Library is an invaluable source of not just freely available eBooks, but also a whole lot of useful information about them. An initiative of the non-profit Internet Archive, Open Library has a collection of 1 million public domain eBooks, all of which can be freely downloaded in numerous formats like EPUB, DJVU, MOBI, and PDF. You can also read the eBooks online, and the collection includes eBooks on numerous subjects/genres like Fiction, Classics, Children, and Drama. Open Library also records important information (e.g. author name, classification, current edition) about the eBooks in its database, pulling the information from sources like the Library of Congress, and Amazon. 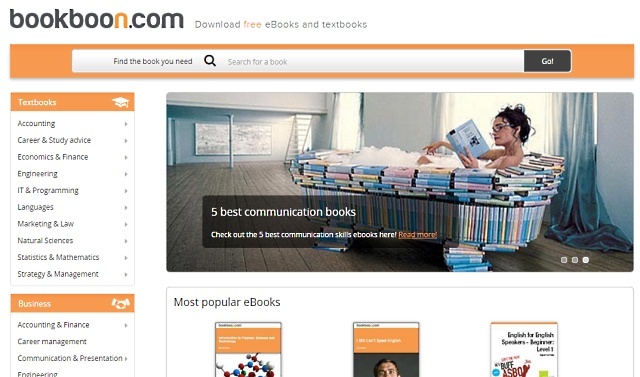 It also partners with numerous book stores, enabling users to borrow books for reading online. 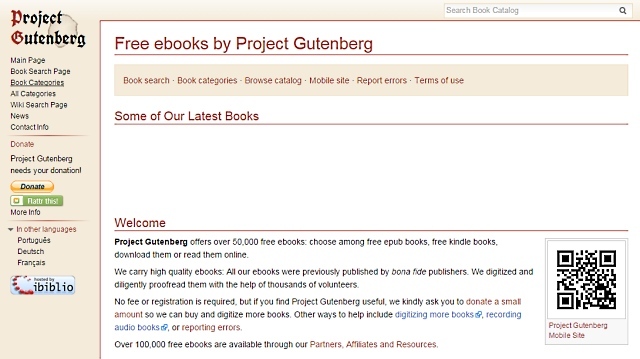 Arguably one of the most famous and well known sources of free eBooks, Project Gutenberg is a volunteer effort aimed at making eBooks (and in a broader sense, the knowledge they contain) available to everyone free of cost. Having over 50,000 titles (as of this writing), most of the eBooks available on Project Gutenberg are available under the public domain. From Classics to Periodicals, and from History to Social Sciences, there are books available on a diverse range of subjects. The latest additions to the website are shown on the homepage, and you can also use the site-wide search if you’re looking for something specific. 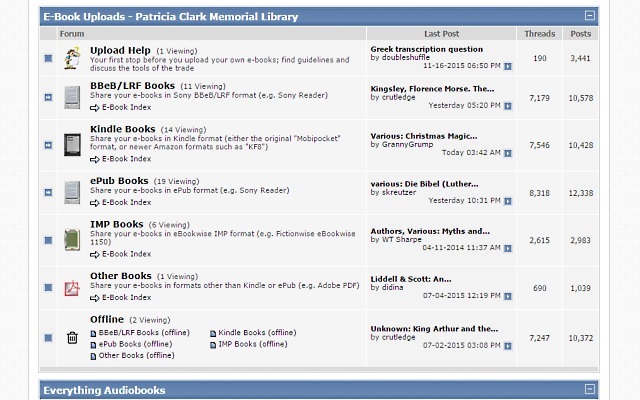 Most of the books can be downloaded in a variety of formats, such as EPUB, MOBI, and TXT. What’s more, you can also save the eBooks directly to a variety of cloud storage services, like Dropbox, Google Drive, and OneDrive. Love the literary works of Indie authors? You’re going to love Smashwords. 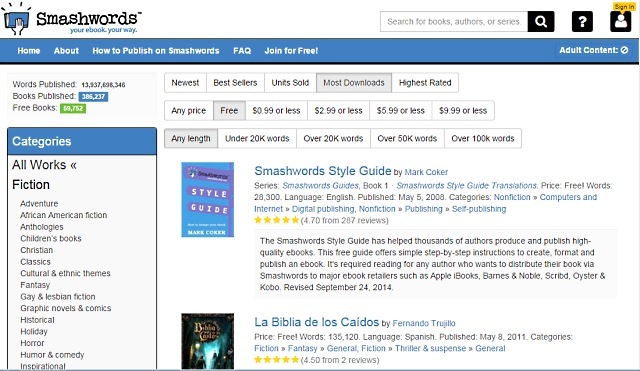 At its core, Smashwords is a web based platform that enables authors/publishers around the world to publish and distribute their works to retailers. But that’s not all. It’s an invaluable source of freely available eBooks, spanning an insane variety of subject topics/genres, such as Anthologies, Fantasy, Horror, Mystery, Romance (Fiction); and Career Guides, Entertainment, General Reference, Philosophy, Science (Non-Fiction). Navigating the website is extremely simple, and you can use the quick filter buttons to sort the results based on parameters like word length, and ratings.The categories/genres are listed on the left. Apart from thousands of free eBooks, paid titles are also available at numerous price points. Once you’ve found the eBook you’re looking for, you can download it in multiple formats like EPUB, MOBI, PDB, and TXT. The eBooks can also be read online. 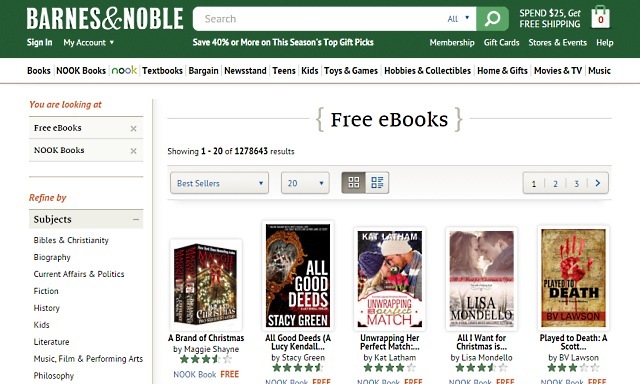 Want quick and no-fuss access to hundreds of free eBooks? Loyal Books is exactly what you need. And the best thing is that it doesn’t only have eBooks, but audiobooks as well. From Adventure to Comedy, and from Nature to Tragedy, Loyal Books’ collection of free, public domain eBooks has something for everyone. It even boasts works from world renowned personalities such as Benjamin Franklin, Oscar Wilde, Confucius, and Karl Marx. 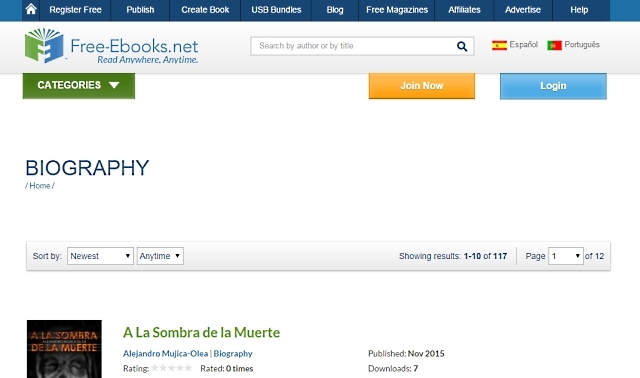 The website sports a fairly straightforward UI, and a sidebar on the left lets you quickly browse books based on specific genres, as well as those available in other (Non-English) languages. Once you’ve found the eBook of your choice, you can download it in several formats like EPUB, MOBI, and TXT. 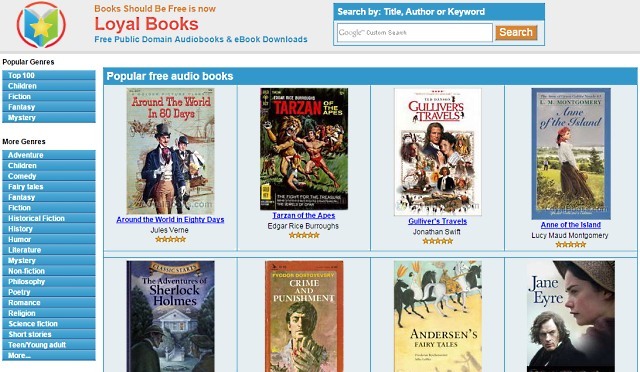 eBooks can be also read online, and for those titles that are available as Audiobooks, you can either stream online, or download them as MP3s or Podcasts. What makes Bookbub stand apart from the others is that it not only gets you some really great eBooks, but also serves up personalized recommendations based on your interests. 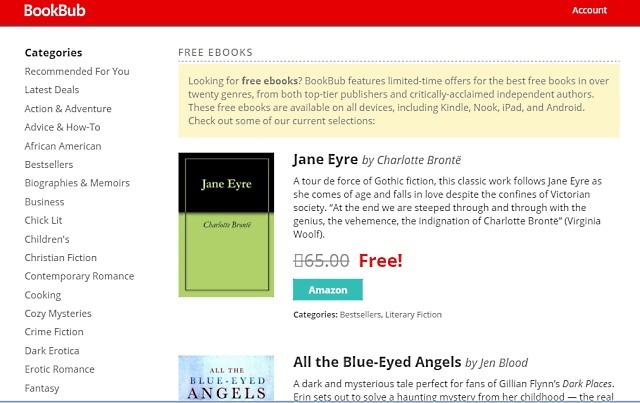 Bookbub’s collection of free eBooks keeps on constantly changing, based on which eBooks are available for free at any given time. However, you can be almost sure of always finding some really good titles, including at times, even bestsellers from critically acclaimed independent authors. The eBooks are available across a broad spectrum of categories/genres, including Biographies & Memoirs, Cooking, Historical Mysteries, Literary Fiction, and Thrillers. Based on which eBooks are available for free, they can be downloaded directly to the eBook reader devices such as Kindle, Nook, and Kobo (in the formats that the devices support) from their respective online bookstores. And of course, you can also find discounted deals on numerous other eBooks. All you need to do is create a free account, fill in your genre/subject preferences, and Bookbub will provide you regular recommendations on the best deals. How cool is that? If you’re new to this whole concept of eBooks, eReader devices, and stuff like that, there’s probably no better place to start off than MobileRead Forums. Put simply, it’s a storehouse of invaluable information regarding everything eBooks. As the name suggests, MobileRead Forums is a web-based forum. It is a community driven website, having numerous user submitted threads divided into a bunch of primary categories like eBook readers, eBook software, and more. So whether you’re thinking about buying a new eBook reader device, confused about the different eBook formats, or just want some recommendations about what your next read should be, MobileRead Forums’ community will help you out. 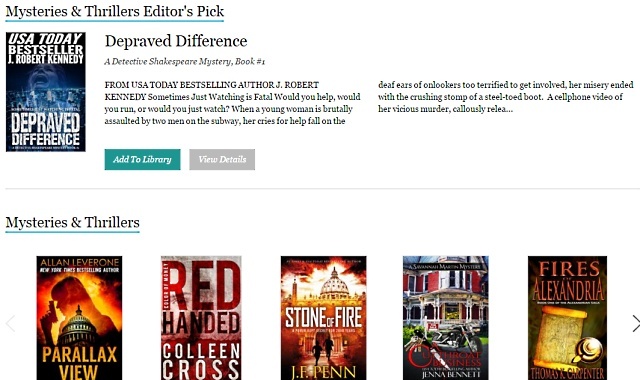 One of the more interesting sub-sections of the website is the eBook uploads sub-section, where users upload many great eBooks in various, spanning multiple genres/categories such as Non-Fiction, Drama, and Thrillers. The uploaded eBooks are generally public domain, and often sourced from databases like Project Gutenberg. Furthermore, they are available in almost all popular formats, such as EPUB, MOBI, TXT, and PDF. In the simplest of words, Wikibooks can be described as the Wikipedia of books. It’s essentially an open-content collection of textbooks that anyone can edit, thus making it an incredible resource of user contributed content. 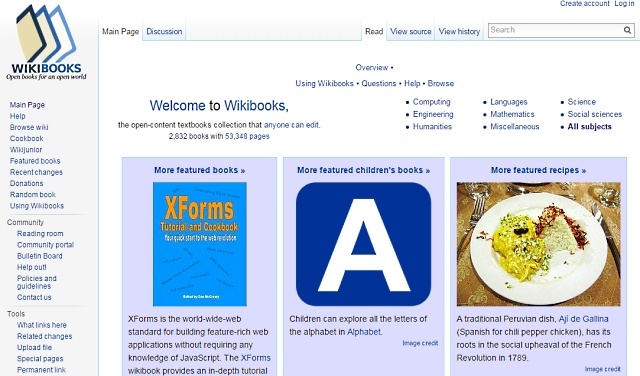 Wikibooks, as the name pretty much explains, is a sister project of Wikipedia. Having over 2,800 books, its collection includes a lot of non-fiction content, based on subjects like Computing, Humanities, Science, Languages, and Engineering, each further sub-divided into multiple categories. This makes navigation really easy when you’re looking for something specific. And of course, you can use the site-wide search as well. Subject specific eBooks are categorized as Completed, Nearing Completion etc., based on their completion status by the editing community. The eBooks can be read online, having interlinked pages just like regular webpages, and can be downloaded as PDF files as well. 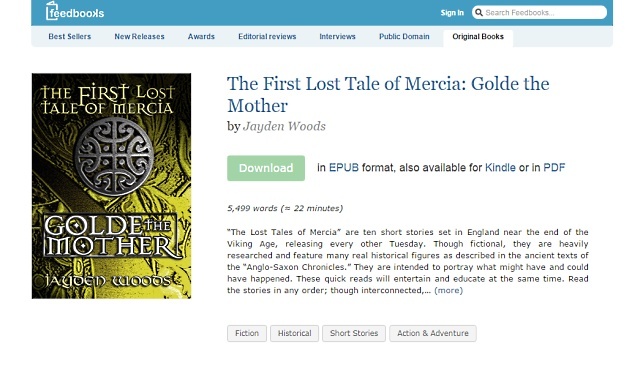 Another great source of getting free and public domain eBooks, ManyBooks boasts of a pretty solid collection, and you can be sure of finding something of your liking once you start digging through it. ManyBooks’ collection consists of over 33,000 titles, covering a whole gamut of genres like Art, Drama, Fiction & Literature, Science, and Travel. What’s more, navigating the website is a breeze, thanks to handy, self-explanatory sub-sections which let you browse the collection based on parameters like authors, languages, and title names. You can also search for eBooks, and check out the Recent Additions and Special Collections sub-sections. Each eBook’s detail page lists helpful information about it (e.g. author name, genre, word count), and once you’ve found the eBook of your choice, you can download it in popular formats like EPUB, MOBI, and PDF. Nearly all of the eBooks are public-domain, and are fully legal to download. Feedbooks is en online retailer of eBooks that provides a platform to upcoming and independent authors to publish their works. Unsurprisingly, it has a pretty robust catalog of some really good and decently priced eBooks. But that’s not everything. Feedbooks also has quite a collection of both original and public domain eBooks, that you can download legally and read on any device you want. From Action & Adventure to Short Stories, and from Mystery & Detective to Horror, Feedbooks’ collection has something for everyone. The detail pages of the eBooks include helpful information like synopsis, word count, and more. The eBooks themselves can be dowloaded in all popular formats like EPUB, MOBI (for Kindle), and PDF. Feedbooks includes other interesting sections like Editorial Reviews, Interviews etc. that are worth checking out too. Just like their physical counterparts, eBooks are not just limited to novels and short stories. They also include academic eBooks, which are specifically useful for the student community. And this is where Bookboon comes into the picture. Boasting a quality catalog of academic textbooks and other educational material, Bookboon, true to its name, is indeed a boon for the students and professionals. It includes numerous freely downloadable textbooks, available on subjects like Accounting, Economics & Finance, IT & Programming, Languages, and Natural Sciences. Other than that, there are also eBooks for business professionals, covering subjects like Entrepreneurship, Marketing & Sales, and many more. The subjects are listed on the left, making navigation incredibly easy, and you can search as well. The eBooks can be downloaded with one click in the PDF format, and are ad-supported. However, you can opt for the premium subscription ($3.99/month) for ad-free access and an even broader collection. While we’re on the discussion of eBooks catered towards the student community, it’s only fitting to talk about HathiTrust, which is a one of a kind digital library of educational titles. Essentially, HathiTrust is a collaborative effort of numerous academic and research organizations in the U.S., aimed at providing students, researchers (and anyone, in general) free access to content digitized from libraries around the world. You can use its powerful search to look for any title across the millions of eBooks in its database. Not only that, you can also go through the pre-curated collections, consiting of titles covering genres/subjects like Ancestory & Genealogy, Manuscripts, and 19th-20th Century Psychology Texts. 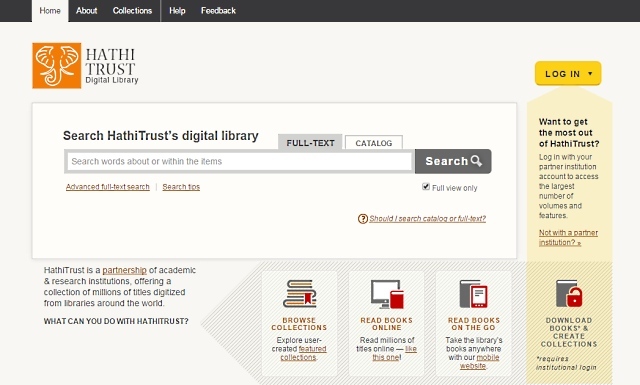 Just about every eBook in HathiTrust’s digital library can be read online. However, if you want to download eBooks for offline reading and create your own collections, you need to login with the official email address provided by your educational institution. The name says it all. If you’re looking for free eBooks, you should definitely check out, well, Free Ebooks. From works of fiction, to academic texts, Free Ebooks has it all. There’s quite a healthy collection of titles available at Free Ebooks. When it comes to fiction, there are eBooks spanning genres like Drama, Humor, Mystery, Poetry, and Romance. On the non-fiction side, you have everything from Biography and Games, to Marketing and Reference. Other than that, there are academic textbooks (Antropology, History etc. ), and audiobooks as well. You can use the site-wide search, as well as Top 10 and Featured collections. However, the free level account only lets you download 5 eBooks of your choice per month, and that too only in the PDF format. However, you can go for the V.I.P. level account (starting at $7.95/month) for goodies like unlimited downloads, and that too in multiple formats. 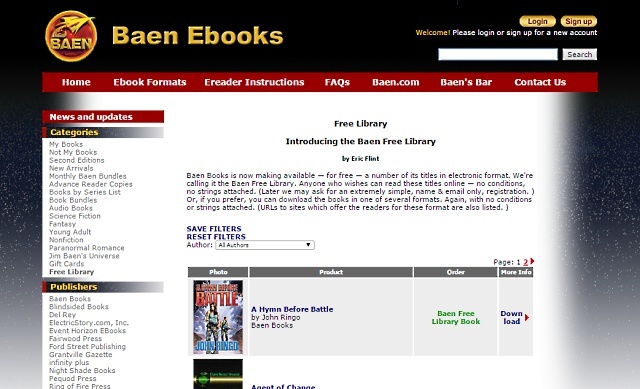 Although its website may look like something from the early 90s, but Baen Ebooks has a fairly good collection of free eBooks that make it worth checking out. No seriously, it’s good. Basically, Bean Ebooks is an online store that sells DRM free eBooks spanning a variety of genres. However, they also have a free library that includes quite a few really nice eBook titles that you can download legally for absolutely nothing. The eBooks are primarily based on the Science Fiction and Fantasy genres, although there are some other titles as well. Each eBook’s detail page includes information like synopsis, and author name. The eBooks can be read online, as well as downloaded in almost all popular formats, such as EPUB, MOBI, and PDF. There are other eReader device specific formats available for download too, and you can also email the eBooks to yourself. Probably the most popular eBook reader devices out there, Amazon’s Kindle line is a great way to access Amazon’s huge library of eBooks. All you have to do is go to the Kindle store, and search for “free eBooks.” The Amazon Kindle library has over 32,000 free eBooks, covering everything from Action & Adventure to Travel. 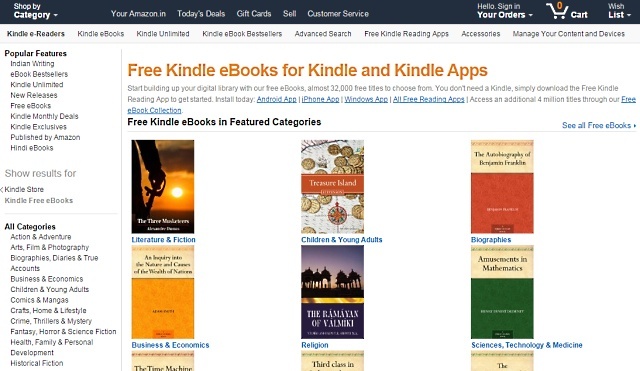 Simply download, and sync/download the eBooks to your Kindle device, and Amazon account. Have a Nook eBook reader device? Then you also have access to the incredible collection of free (and paid) eBook titles from Barnes & Noble. Go to the Nook store, search for “free eBooks,” and you’ll find thousands of great free titles, spanning across categories/genres like Biography, Literature, Philosophy, Travel, and much more. The free eBooks can be synced/downloaded to your Nook device, and are automatically saved to your Barnes & Noble account. If you’re having one of the awesome Kobo eBook reader devices, you can check out the great collection of free (and paid) eBooks available on the Kobo store. There are titles available across nearly all genres, such as Mysteries & Thrillers, Sci-Fi & Fantasy, and a lot more. Once you’ve found what you’re looking for, simply hit the Add To Library button, and the eBook will be downloaded/synced to your Kobo eReader device. As simple as that! Craving for even more eBook goodness? Then you have to check out the absolutely amazing Free eBooks thread on Reddit. It’s a near-daily updated source of some really great free eBooks that you can download legally, having titles across all genres and subject categories. It also includes links to even more sources of Free eBooks. All Pumped Up To Start Reading? With so many great online sources providing access to an overwhelming number of great free eBooks, there’s never been a better time to get into reading. Want some nice fiction reads? Check out Smashwords, Bookbub, or Project Gutenberg. Looking for academic texts? Go for Hathi Trust or Bookboon. And if you have one of those cool eBook reader devices, you already know where to look. So check all these sources, and I’m sure you’ll find something great to read. Know of some other nice free eBook sources that could’ve been included in the list? Shout out in the comments below.